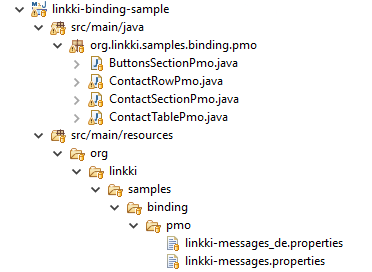 In this example, NLS Strings in org.linkki.samples.binding.pmo.ButtonsSectionPmo that need to be translated must be defined in org.linkki.samples.binding.pmo.linkki-messages.properties. These .properties files contain messages in text form, each file represents one supported language for the PMOs in the same folder. It’s important that these files share the base name linkki-messages. A file with the base name has to be present in the resource folder and acts as fall back option if no specific .properties file is found for a locale. You can support as many languages as you want by simple adding another .properties file to the resource folder, its name consisting of the base name and the language code separated by _. As shown in the example above, the German translations are represented by the file linkki-messages_de.properties. Note that each of these files has to contain the same items, but translated for the language they represent. linkki always tries to retrieve a value from the linkki-messages.properties, if the file exists. That means that the label "Name" that is defined directly in the annotation @UILabel above will not be used in this constellation. The entry ContactRowPmo_name_label=name overrides it as default value if there is no specific .properties file for the user’s locale. It is useful to include the default label in the annotation to avoid having to look it up in the properties file when viewing the source code.